Spencer Thomas Bachus III /ˈbækəs/ (born December 28, 1947) is an American politician. He is a former U.S. Representative for the state of Alabama, serving from 1993 to 2015. A member of the Republican Party, he served as ranking member (2007–2011) and chairman (2011–2013) of the House Financial Services Committee. On September 30, 2013, Bachus announced his retirement from Congress. His term ended in 2015. Born and raised in Birmingham, Bachus graduated from Auburn University and the University of Alabama Law School. He served in the Alabama National Guard before being elected to the Alabama State School Board in 1986 and holding the position of Alabama Republican Party Chairman in 1991. He was elected to the U.S. House of Representatives in 1992, and was re-elected by wide margins. From 2006 to 2012, Bachus was the leading Republican on the House Financial Services Committee, serving as committee chairman when his party held a House majority during the 112th Congress. Due to House Republican term limits on committee leadership positions, Bachus was succeeded by Congressman Jeb Hensarling in 2013. Bachus was born in Birmingham, Alabama, the son of Edith (née Wells) and Jim Bachus Jr. He graduated from Auburn University in 1969 where he became a member of the Phi Kappa Tau fraternity. He served in the Alabama National Guard from 1969 to 1971, during the Vietnam War, while attending law school; Bachus earned a Juris Doctor degree from the University of Alabama Law School in 1972. Prior to his political career, he owned a sawmill and practiced law until 1992. In 1982, Bachus was elected to the Alabama Senate. Because new legislative elections were scheduled for 1983, he served only one year. In 1983 he was elected to the Alabama House of Representatives. In 1986, he was elected as the first Republican to the Alabama State Board of Education, serving one four-year term representing the 6th District. In 1990, he ran unsuccessfully for Attorney General of Alabama. In 1991, he became Chairman of the Alabama Republican Party, serving in that position until his campaign for Congress. From 2006 to 2012, Bachus was the leading Republican on the House Financial Services Committee, serving as committee chairman when his party held a House majority during the 112th Congress. Due to House Republican term limits on committee leadership positions, Bachus was named Chairman Emeritus of the Financial Services Committee and rejoined the Judiciary Committee, which he had to take leave of when named Financial Services Chair. On September 30, 2013, Bachus announced his retirement from Congress. His term ended in January 2015. Upon his retirement in 2014, Norman Ornstein wrote a column in the National Journal lamenting the "Exodus of Problem Solvers on Capitol Hill." Alabama's 6th congressional district was redistricted based on the 1990 United States Census. In the 1992 election, Bachus defeated incumbent Democrat Ben Erdreich. Bachus was endorsed by The Birmingham News. Bachus got a major assist from redistricting, which drew most of Birmingham's black neighborhoods into the majority-black 7th district, replacing them with suburban and Republican territory around Birmingham and Tuscaloosa. Despite being outspent almost 2 to 1, the 7th's more Republican bent was enough to give Bachus the victory by seven points. He was undoubtedly helped by George H. W. Bush winning the district by over 30 points. Bachus would never face another contest nearly that close. No Democrat even filed from 2000 to 2010; before then, he defeated three nominal Democratic challengers with over 70 percent of the vote each time. In the 2004 Republican primary, Bachus defeated Phillip Jauregui, a member of former Alabama Chief Justice Roy Moore's legal team. Bachus was unopposed in the 2004 general election. In the 2010 midterm elections, Bachus easily turned back a challenge from pastor Stan Cooke in the Republican primary, winning 75% of the vote. Bachus decided to run for re-election after redistricting to the newly redrawn 6th district. In the Republican primary, he drew three challengers, most notably State Senator Scott Beason. Beason ran well to Bachus's right and called for "true conservative leadership." Bachus heavily outspent him. The incumbent spent over $1.5 million, outspending Beason 45–1. Bachus defeated him 59%–27%. He won every county in the district except for Blount County. For the first time since 1998, Bachus faced a Democratic challenger. Colonel Penny Bailey defeated William Barnes to become the Democratic nominee. However, Bachus turned back this challenge fairly easily, defeating Bailey with 71 percent of the vote. Bachus had a conservative voting record, with a lifetime rating of 92 from the American Conservative Union. He was a signer of Americans for Tax Reform's Taxpayer Protection Pledge. Bachus was an active legislator, engaged in many important issues over the course of his congressional career. He helped amend the Fair Credit Reporting Act to curtail identity theft and ease consumer access to their credit reports. Bachus also had a reputation for good constituent service. In the late 1990s, during his tenure as Chairman of the Banking Oversight Committee, he uncovered the Community Development Financial Institute (CDFI), which led to the resignation of the top two CDFI officials. In the 1990s he became an advocate of international debt relief for the Third World, and joined a broad coalition of activists in a one-day fast to demand action, which was ultimately successful. He criticized the Bush administration over negotiations with the genocidal regime in Sudan, and urged Bush to stop payment of oil revenues to the Sudanese government. Bachus was credited when the Bush Administration decided, in 2007, to place sanctions on Sudan. In 1995, Bachus pushed for the creation of the Alabama National Cemetery, a United States National Cemetery located in Montevallo, Alabama. Bachus said, "The Alabama National Cemetery will always be the thing I'm most proud of...It was the second one built, and I'm so thankful for it. We now (have) veterans from every war buried there." On November 4, 1999, Bachus voted in favor of the Gramm-Leach-Bliley Act. This law repealed part of the Glass–Steagall Act of 1933, removing barriers in the market among banking companies, securities companies and insurance companies that prohibited any one institution from acting as any combination of an investment bank, a commercial bank, and an insurance company. With the passage of the Gramm–Leach–Bliley Act, commercial banks, investment banks, securities firms, and insurance companies were allowed to consolidate. The legislation was signed into law by President Bill Clinton. While Bachus was Chairman of the Subcommittee on Financial Institutions and Consumer Credit (2001 – 2006), the House of Representatives passed and the President signed into law the Fair and Accurate Credit Transactions Act of 2003 (P.L. 108-159), which contained the strongest federal identity theft protections enacted into law to that date and entitled consumers to annual free credit reports from each of three major credit bureaus. Additionally, while Bachus was Subcommittee Chairman, enacted into law was The Check Clearing for the 21st Century (CHECK) Act of 2003 (P.L. 108-100). This law authorized the use of digital versions of paper checks for transfer by financial institutions, saving money and eliminating delays and losses caused by the transportation of physical checks. Again, as Subcommittee Chairman, Bachus played a leading role in passing the Federal Deposit Insurance Reform Conforming Amendments Act of 2005 (P.L. 109-173), which reformed the federal deposit insurance system and raised the FDIC coverage limit for retirement accounts to $250,000. On July 26, 2002 he voted for the Homeland Security Act of 2002 which created the United States Department of Homeland Security. On December 14, 2005 he voted for the reauthorization of the USA Patriot Act. The USA PATRIOT Act is an Act of Congress that was signed into law by President George W. Bush on October 26, 2001. On May 26, 2011, President Barack Obama signed the PATRIOT Sunsets Extension Act of 2011. In 2006, he cosponsored H.R. 4411, the Goodlatte-Leach Internet Gambling Prohibition Act and H.R. 4777, the Internet Gambling Prohibition Act. In 2008, he opposed H.R. 5767, the Payment Systems Protection Act (a bill that sought to place a moratorium on enforcement of the Unlawful Internet Gambling Enforcement Act while the U.S. Treasury Department and the Federal Reserve defined "unlawful Internet gambling"). In 2006, as Chairman of the Subcommittee on Financial Institutions and Consumer Credit, Bachus worked on bipartisan draft subprime mortgage reform legislation to address abuses in the lending market. According to the book Act of Congress by Robert G. Kaiser, "Bachus thought that if it had passed in 2005, subprime lending would have dried up, and the Great Crash could have been avoided or at least made much less serious." In 2008, Bachus proposed the Secure and Fair Enforcement for Mortgage Licensing, an addition to the Housing and Economic Recovery Act of 2008 that required licensing for mortgage brokers. In 2011, the FBI and American Football Coaches Association honored Bachus for his advocacy and support for the National Child Identification Program. The National Child Identification Program tries to help combat cases of missing or abducted children by providing identification kits to parents that allow the parents or other guardians to keep their children's fingerprints and other identifying characteristics on file at their home. In 2012, Bachus called on Veterans Affairs Secretary Eric Shinseki to speed up veterans claims processing. In a letter to the Secretary, Bachus wrote that the benefit claims backlog facing veterans nationwide is causing veterans to face growing debt or postpone plans to pursue college education. He demanded that the Department outline the specific steps being taken to reduce the backlog. In 2013, Bachus was the only member of Alabama's congressional delegation to vote in favor of defunding the National Security Agency's collection of phone records. Bachus has been an outspoken critic of the NSA program since news of it was leaked by Edward Snowden. Bachus was a lead House sponsor of legislation offering federal protection to the American flag, prohibiting its desecration. On Flag Day 2013, he joined Rep. Daniel Lipinski (D-IL) to co-sponsor an amendment to the U.S. Constitution that says "Congress shall have power to prohibit the physical desecration of the flag of the United States." Bachus was credited with being a lead advocate for locating and maintaining the National Computer Forensics Institute in the City of Hoover Public Safety Building in Hoover, Alabama: "The National Computer Forensics Institute was created in 2007 with money from local, state and federal entities. Since opening in 2008, it has trained 932 state and local law enforcement officers from more than 300 agencies in all 50 states, according to congressional testimony from Pablo Martinez, deputy special agent in charge of the criminal investigation division, cyber crimes operations for the U.S. Secret Service." During deliberations on the legislative response to the Financial Crisis of 2008, Bachus, as Ranking Member on the Financial Services Committee, was one of the original proponents of the Capital Purchase Program (CPP) that the U.S. Treasury eventually adopted as the primary method of stabilizing the U.S. banking system. Spencer Bachus...had another idea. Instead of the complicated plan for auctioning off toxic assets, why not just inject capital directly into the troubled banks by buying their shares? This had been done successfully in similar situations, in Sweden, for example, in a banking crisis there in 1992...Bachus and [Senior Aide Larry] Lavender had beed discussing the possibility for months as they watched the American crisis unfold, and Bachus asked about it now. (Months later) Paulson asked his staff to figure out how to do what Spencer Bachus had suggested on September 18 – use government money to invest directly in troubled banks. At a forum entitled Five Years Later: A Financial Crisis Symposium co-hosted by the University of Chicago and the Paulson Institute on October 29, 2013, former Financial Services Chairman Barney Frank stated, "Spencer Bachus gets some credit for this. In the meeting, he was the senior Republican, the leader of the Republican minority at the time, and when it was presented as buying up the assets, he was one of the first in our meetings to raise the notion of, well, how about a capital injection." The capital purchase provision was included in the Emergency Economic Stabilization Act signed into law by President George W. Bush on October 3, 2008. According to the U.S. Treasury, in exchange for the capital funding made available to participating institutions, "Treasury received stock or debt securities in exchange for those investments. Most financial institutions participating in CPP pay Treasury a five percent dividend on preferred shares for the first five years and a nine percent rate thereafter. In addition, Treasury received warrants to purchase common shares or other securities from the banks at a time of the CPP investment. The purpose of the additional securities was to enable taxpayers to recap additional returns on their investments as banks recover." In a May 2013 report, the Government Accountability Office stated, "As of March 31, 2013, the U.S. Department of the Treasury had received about $222 billion from its Capital Purchase Program investments, exceeding the approximately $205 billion it had disbursed. Treasury estimated at the end of December 2012 that CPP would have an approximate lifetime income of $15 billion after all institutions had exited the program." Bachus also was active in advancing the search for Natalee Holloway, who went missing while on a senior trip to Aruba. Holloway attended high school in Mountain Brook, an affluent Birmingham suburb in the congressman's district. In 2005, Bill Maher commented about the Army missing its recruiting goal by 42% in April, saying, "More people joined the Michael Jackson fan club. We've done picked all the low-lying Lynndie England fruit, and now we need warm bodies." Bachus responded to Maher's comments, saying "I think it borders on treason. In treason, one definition is to undermine the effort or national security of our country." In 2007, Bachus was falsely accused of insider trading. He was subsequently cleared by the Office of Congressional Ethics. The Congressional Ethics inquiry stemmed from an allegation by Peter Schweizer and later reported by 60 Minutes that Bachus made trades with a number of short term stock options, betting that stocks would rise or fall for a quick profit or loss. Schweizer claimed that from July through November 2008, Bachus traded in options at least forty times. During this period, Bachus was one of the congressional leaders getting private briefings from Secretary of the Treasury Hank Paulson and Federal Reserve Bank Chairman Ben Bernanke about the worsening financial crisis. Bachus said that he "never trades on non public information, or financial services stocks". On April 30, 2012, the Office of Congressional Ethics announced that they had found no evidence of violations of insider-trading rules and recommended that the case against him be closed. Roderick Hills and Harvey Pitt, former Chairmen of the Securities and Exchange Commission who reviewed the accusations, wrote "the original source for these allegations was a sensational, but factually inaccurate, book, followed by an adulatory (but equally inaccurate) '60 Minutes' segment about it. The allegations in the book, vis-à-vis Mr. Bachus, are inaccurate; far worse, however, is that these allegations are laughable to serious students of insider trading law." On April 9, 2009, Bachus said "Some of the men and women I work with in Congress are socialists," later stating that 17 members of the House of Representatives are socialists. In a 2010 interview with the Birmingham News, Bachus spoke about the outlook he would bring to his chairmanship of the Financial Services Committee, saying "In Washington, the view is that the banks are to be regulated, and my view is that Washington and the regulators are there to serve the banks." The comment was criticized in a blog post by ThinkProgress. On November 4, 2010, while in the midst of a battle for the chairmanship of the House Financial Services Committee with Rep. Ed Royce (R-CA) and immediately following the 2010 general election, Bachus told the South Shelby (Ala.) Chamber of Commerce that former Alaska Governor Sarah Palin and candidates she endorsed cost the Republican Party control of the U.S. Senate, saying: "The Senate would be Republican today except for states (in which Gov. Palin endorsed candidates) like Christine O'Donnell in Delaware. Sarah Palin cost us control of the Senate." He went on to say that Tea Party candidates did well in U.S. House races, but in the U.S. Senate races, "they didn't do well at all." Conservative writers and lawmakers including Hugh Hewitt, BigGovernment.com's Rich Muny, and Senator James Inhofe (R-OK) immediately defended both Sarah Palin and the Tea Party movement, crediting them with gains in both the House and the Senate. Hewitt and Muny further demanded that Bachus not be awarded chairmanship of the House Financial Services Committee. Palin responded with criticism of the "Bachus bigger government agenda," citing Bachus's support for the Troubled Asset Relief Program and "Cash for Clunkers." Subcommittee on Crime, Terrorism, Homeland Security, and Investigations. Bachus and his wife, Linda, have been recognized by multiple organizations for their support and contributions to medical research. Bachus has been called a "champion for cancer patients"; he and Mrs. Bachus were awarded the National Distinguished Advocacy Award for Excellence in Cancer-Fighting Public Policy by The American Cancer Society Cancer Action Network (ACS CAN), the group's highest legislative honor. Bachus was a member of the Bipartisan Congressional Task Force on Alzheimer's Disease. During his Congressional tenure, he was also a member of the Cancer Caucus, Autism Caucus, Alzheimer's Task Force, Biomedical Research Caucus, Immigration Reform Caucus, Pro-Life Caucus. In October 2014, Mr. and Mrs. Bachus were honored at the National Multiple Sclerosis Society's Ambassadors Ball for their efforts on behalf of the organization's Alabama-Mississippi chapter. In September 2014, Linda Bachus was awarded Congressional Families Leadership Award for her role as the first executive director of the Congressional Families Cancer Prevention Program. Bachus sponsored legislation prioritizing palliative care. Bachus has three children and two step-children with his wife, Linda. *Write-in and minor candidate notes: In 1992, write-ins received 121 votes. In 1994, write-ins received 145 votes. In 1996, write-ins received 80 votes. In 1998, write-ins received 164 votes. ^ "Spencer Bachus, dean of Alabama delegation, retiring". Politico. ^ a b "Bachus, Spencer T., III, (1947–)". Biographical Directory of the United States Congress. Retrieved May 31, 2017. ^ "Jeb Hensarling eyes financial panel chairmanship". Politico. ^ "Spencer Thomas Bachus III". rootsweb. ancestry.com. ^ "Auburn University Libraries / Aug. 20: Spencer Bachus Presents Congressional Papers | What's New at the Auburn Libraries". www.lib.auburn.edu. Retrieved May 30, 2017. ^ "Phi Kappa Tau Hall of Fame and Alumni Member Listing". Phi Kappa Tau. Retrieved May 30, 2017. ^ a b "Spencer Bachus | Encyclopedia of Alabama". Encyclopedia of Alabama. Retrieved May 30, 2017. ^ "Veterans in the U.S. House of Representatives 109th Congress" (PDF). Navy League. Archived from the original (PDF) on June 26, 2007. Retrieved December 9, 2006. ^ a b Talbot, George (September 30, 2013). "Rep. Spencer Bachus won't seek re-election in 2014". AL.com. Retrieved May 31, 2017. ^ Southall, Ashley (September 30, 2013). "Alabama's Bachus Won't Seek Re-Election in 2014". New York Times. Retrieved May 31, 2017. ^ Ornstein, Norman (February 26, 2014). "The Exodus of Problem Solvers on Capitol Hill". The National Journal. ^ Booth, William; Phillips, Don; Sawyer, Kathy (November 5, 1992). "The 1992 Elections State by State: The South". Washington Post. Retrieved May 31, 2017. ^ a b c Carter, Robert (September 30, 2013). "Spencer Bachus to retire from Congress; Beason undecided on running, Standridge will pass". The North Jefferson News. Retrieved May 31, 2017. ^ "The 2004 Elections: State by State -- South; Strong performances by President Bush and Republican senators". New York Times. November 4, 2004. Retrieved May 15, 2017. ^ "U.S. Rep. Spencer Bachus turns back three challengers in primary and wins without run-off". Retrieved March 14, 2012. ^ "Alabama Secretary of State" (PDF). Archived from the original (PDF) on September 11, 2012. ^ "Bachus' plan could force Sudan to stop humanitarian crisis". Tuscaloosa News. July 13, 2004. ^ "Bush finally comes around to Bachus view". Tuscaloosa News. June 2, 2007. ^ Griffey, Jan (December 23, 2013). "Bachus reflects on 20 years in office". The Shelby County Reporter. Retrieved February 10, 2014. ^ "House Vote on Conference Report: S. 900 [106th]: Gramm-Leach-Bliley Act". GovTrack. Civic Impulse, LLC. November 4, 1999. ^ "H.R. 5005 Homeland Security Act of 2002 (On Passage of the Bill)". Gov Track. ^ "Bill Summary & Status: 109th Congress (2005–2006): H.R.4411: Internet Gambling Prohibition and Enforcement Act". Thomas. Library of Congress. July 13, 2006. ^ "Bill Summary & Status: 109th Congress (2005–2006): H.R.4777: Internet Gambling Prohibition Act". Thomas. Library of Congress. ^ Kaiser, Robert (January 28, 2014). Act of Congress. Random House. p. 122. ISBN 978-0-307-74451-7. ^ "Bachus Statement On SAFE Act Progress". Financial Services Committee. July 15, 2009. Retrieved May 31, 2017. ^ "Bachus: Ending the Bail Out of Fannie and Freddie". CNBC. 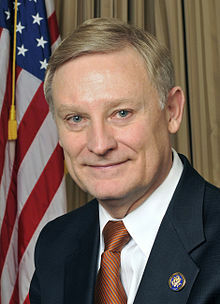 ^ "U.S. Rep. Spencer Bachus honored for support of National Child Identification Program". Al.com. ^ "Congressman Spencer Bachus calls on VA Secretary Eric Shinseki to speed up veterans claims processing". Al.com. ^ "Only one member of Alabama's congressional delegation votes to defund NSA's collection of phone records". Al.com. ^ Orndorff Troyann, Mary. "Orndorff". al.com. Retrieved May 30, 2014. ^ "Five Years Later: A Financial Crisis Symposium". YouTube.com. The University of Chicago. Retrieved July 28, 2014. ^ "Capital Purchase Program". U.S. Department of Treasury. United States Department of Treasury. Retrieved July 28, 2014. ^ "CAPITAL PURCHASE PROGRAM Status of the Program and Financial Health of Remaining Participants" (PDF). GAO.gov. U.S. Government Accountability Office. Retrieved July 28, 2014. ^ "Bill Maher's Remark About Army 'Borders on Treason,' Lawmaker Says". Fox News. Associated Press. May 23, 2010. Archived from the original on April 27, 2006. Retrieved May 24, 2005. ^ David Weigel (November 14, 2011). "Spencer Bachus, Rogue Trader". Slate. Retrieved November 15, 2011. ^ John Bresnahan (November 13, 2011). "'60 Minutes' on 'honest graft'". Politico. Retrieved November 15, 2011. ^ Hills, Roderick. "The politics of congressional ethics". Gadsden Times. Retrieved October 27, 2013. ^ Gray, Jeremy (April 9, 2009). "Bachus tells city and county officials he's worried about socialists in Congress". The Birmingham News. ^ Sims, Bob (April 10, 2009). "Rep. Spencer Bachus of Alabama says 17 members of the Congress are socialists". The Birmingham News. ^ Orndorff, Mary (December 9, 2010). "Spencer Bachus finally gets his chairmanship". Birmingham News. ^ Griffey, Jan (November 7, 2010). "Spencer Bachus: Sarah Palin cost GOP control of U.S. Senate". Shelby County Reporter. ^ Hewitt, Hugh (November 9, 2010). "Will John Boehner Promote Spencer Bachus? The First Big Test For The New Speaker". HughHewitt.com. Archived from the original on November 13, 2010. ^ Muny, Rich (November 9, 2010). "GOP Rep. Spencer Bachus Lashes Out at Tea Party, Sarah Palin". BigGovernment.com. ^ Muny, Rich (November 12, 2010). "Will the GOP Establishment Betray Tea Party for the 'Bachus Bigger Government Agenda'?". BigGovernment.com. ^ Rushing, J. Taylor (November 9, 2010). "Inhofe: Tea Party candidates helped, not hurt GOP". The Hill. ^ Puzzanghera, Jim (November 10, 2010). "Palin drawn into House Financial Services Committee chairmanship fight". L.A. Times. ^ Strong, Jonathan (November 9, 2010). "Palin pushes back at Bachus, cites his 'bigger government agenda'". The Daily Caller. ^ "Bachus has been a champion for cancer patients: guest opinion". January 15, 2015. ^ "Congressman and Mrs. Bachus Nationally Honored for Cancer Awareness and Research Advocacy". September 19, 2014. ^ "The Congressional Task Force on Alzheimer's | Alzheimer's Association". act.alz.org. Retrieved June 7, 2018. ^ "Lend a Hand: Bachus honored for funding multiple sclerosis research". October 11, 2014. ^ Smaby, Monique (September 24, 2014). "Congressional Families Cancer Prevention Program recognizes leadership in prevention". Archived from the original on October 19, 2014. ^ Troyan, Mary (August 5, 2012). "UAB, Congressman Bachus raising palliative care's profile on Capitol Hill". ^ "U.S. Representative - AL6". Wall Street Journal. Retrieved May 31, 2017. This page was last edited on 26 April 2019, at 04:25 (UTC).